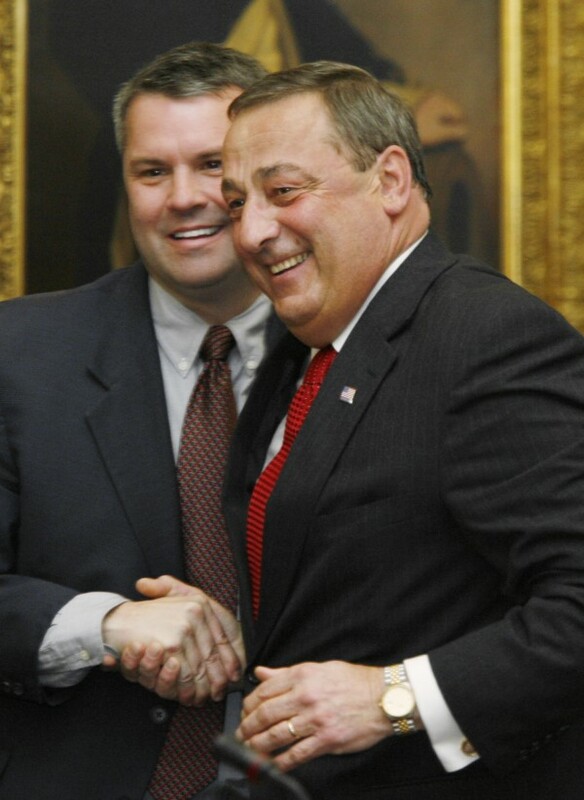 Paul LePage (right) greets Majority Leader Sen. Jonathan Courtney of York as he arrives at the Senate Republican caucus in Augusta in November 2010. SPRINGVALE, Maine — State Sen. Jon Courtney will make his entry into Maine’s 1st District congressional race official this week. The Republican from Springvale plans a series of appearances through the southern Maine district on Thursday. Rallies and business walks are planned at each of the locations, in Sanford, Biddeford, Portland, Wiscasset and Waterville. Courtney is currently the majority leader in the Maine State Senate and has served 10 years in the Legislature. He is the owner of a cleaning business in Springvale. Courtney is trying to unseat incumbent Democratic U.S. Rep. Chellie Pingree, who is seeking her third term in the House. He faces a Republican primary challenge by Patrick Calder of Portland.